Original 1964-65 World Fair Mark IV Cutaway Engine to Sell At Auction In January, 2019! Ask just about any automotive enthusiast, regardless of age, what the best era was for automotive design and horsepower, and you’ll almost always get the same answer – the Sixties. 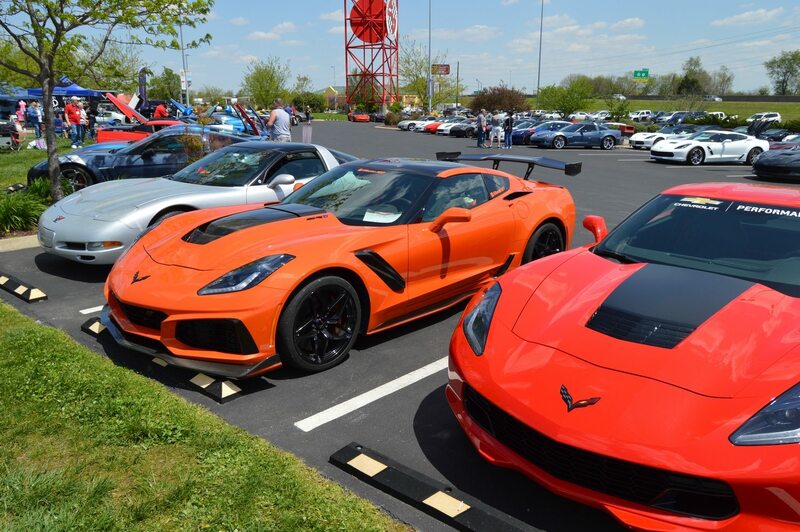 The early 1960’s saw the evolution of the sports car, the birth of the muscle car and the introduction of the big-block Mark IV 396 engine by Chevrolet. At the 1964–65 New York World’s Fair, General Motors Futurama Pavilion was as one of the single largest exhibits that year. 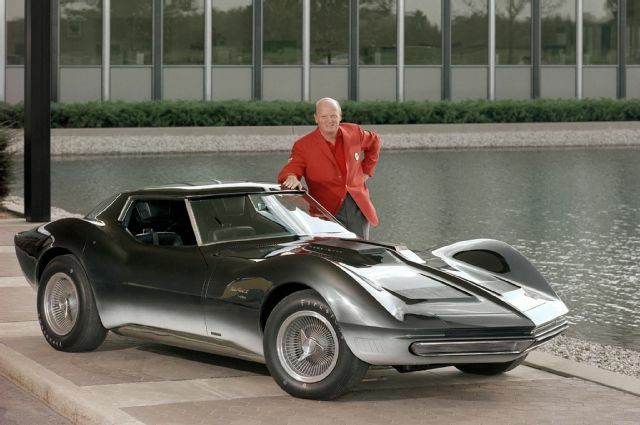 The pavilion featured a number of displays and exhibits centered around the Chevy Corvette including the new Mako Shark II concept vehicle, a cutaway 1965 Sting Ray fuel-injected coupe and a cutaway of the Mark IV 396 engine. 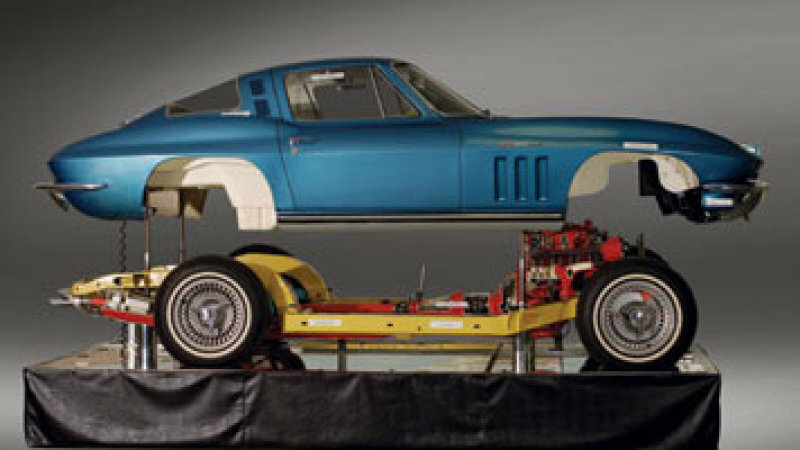 Each of these displays was designed to deliver spectators attending the World Fair with a clear message about the future of the Corvette program – the Mako Shark II represented what the future Corvette would look like, while the 1965 cutaway coupe and 396 engine provided an in-depth look at what the (then current) Corvette had to offer to would-be consumers. The 425-hp, 396 cubic-inch big block engine was to be formally introduced by GM part way through the 1965 model year. Chevrolet engineers, many of whom were present at the World Fair, were only too-excited at the opportunity to boast about this newly developed engine. The Mark IV 396 would produce more horsepower than any other 396 cubic-inch engine developed to date. The 1965 Corvette that was featured at the 1964-65 World’s Fair as part of GM’s Motorama exhibit. 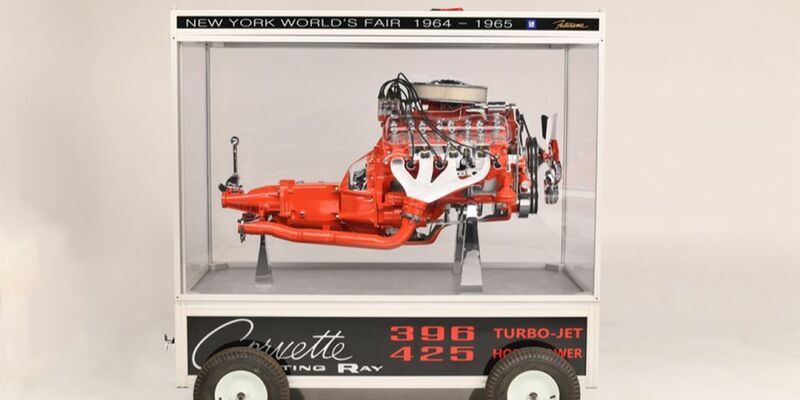 Ironically, both the 396 cubic-inch big block engine and the “Fuelie” Corvette cutaway engine were deemed obsolete almost as soon as they were first introduced at the Futurama exhibit. For starters, it was quickly recognized that the carbureted version of the 396 cost much less than its fuel-injected counterpart. As a result, the carbureted version of the Mark IV engine actually led to the demise of the Rochester fuel-injection system. 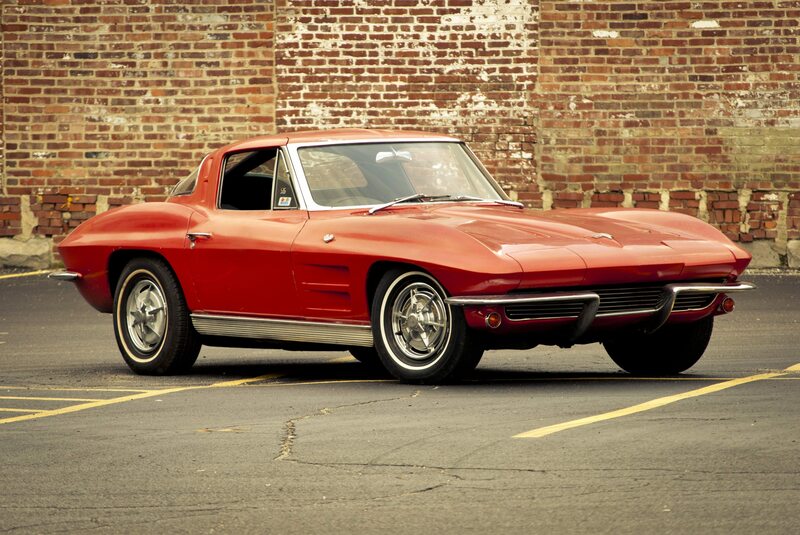 In fact, no “Fuelie” Corvettes would be produced after 1965. As for the 396 engine? It was replaced by Chevrolet’s 427 cubic-inch, big-block engine in order to keep up with competition from Ford and Chrysler’s engine program. While the larger engines would rue the day, the Mark IV 396 would continue to boast more horsepower than any other 396 engine produced by GM until its production ended in 1969. The original Mark IV 396 cubic-inch engine will cross the Barrett Jackson auction block in January, 2019. 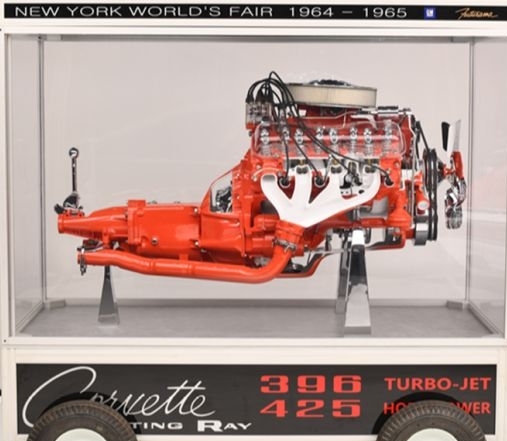 Now, the unique cutaway engine from the Futurama display at the 1964-1965 World’s Fair has been restored to its earlier show-quality glory and will cross the Barrett-Jackson’s Scottsdale auction block in January, 2019. This unique piece of automotive – and Corvette – history will sell at the auction with NO RESERVE, which means that, as long as anyone places a bid on this display, it will go home with a new owner shortly after the start of the new year. The Corvette cutaway engine display is powered by a starter motor and features well-placed cutaways on major components of the powerplant including the transmission bell housing, cylinder head and the exhaust manifolds. These cutaways provide spectators with the ability to look “through” the engine to some of its inner-mechanical components and helps showcase the build quality of this impressive engine platform. From a collector’s standpoint, this is truly a one-of-a-kind piece of automotive history. 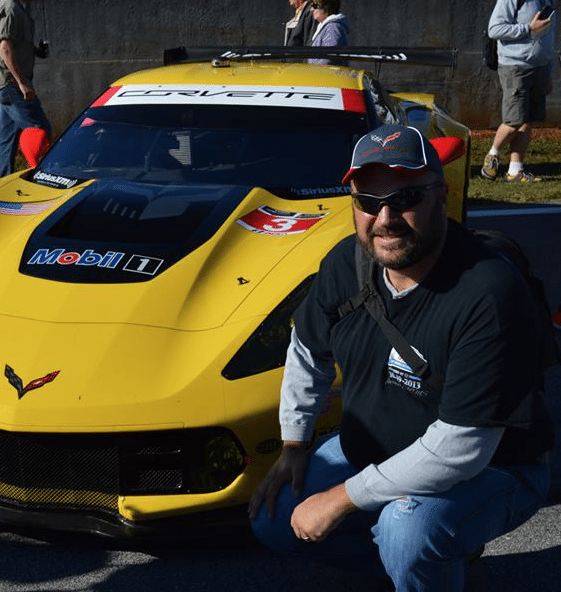 It represents one of the “golden ages” of both General Motors and the Chevy Corvette. Moreover, this unique piece of automotive engineering would make an incredible addition to any enthusiasts garage or automotive collection.